Multiple award-winning Avocado Pear Nourishing Night Cream attributes its success to bioactive New Zealand ingredients. New science discoveries, such as Vinanza Grape®, reveal that extracts from Marlborough sauvignon blanc grape seeds have potent antioxidant levels, which may assist to neutralise free radical damage that results in premature skin ageing. Bound with world famous manuka honey Active 20+, this high performance formulation also keeps skin fresh and moist whilst you rest. There's no better way to resurrect your skin than with the superior restorative qualities of 100% pure avocado oil. This facial night cream also features calendula oil from marigold petals, highly regarded throughout history for its healing and repairing properties. Active manuka honey soothes and moistens your skin, while potent antioxidant Vinanza Grape helps neutralise free radical damage. Suited to most skin conditions including ultra-dry. Apply at sunset by caressing into your face, neck and décolletage after cleansing and toning. Use night after night for ultimate revitalization. Aqua (water), Butyrospermum parkii (shea) butter, squalane (vegetable) extract, Persea gratissima (avocado) oil, Leptospermum scoparium mel (Active 20+ manuka) honey, Macadamia ternifolia (macadamia nut) oil, Calendula officinalis (calendula) oil, Cocos nucifera (coconut) oil, cetearyl olivate, sorbitan olivate, lecithin (vegetable) extract, gluconolactone, sodium benzoate, calcium gluconate, Vitis vinifera (Vinanza® Grape grape seed) extract, tocopherol (Vitamin E), essential oil fragrances of sandalwood, ylang ylang and patchouli: benzyl benzoate†, benzyl salicylate†, citral†, d-Limonene†, linalool†, eugenol†, farnesol†, geraniol†, isoeugenol†. † Component of essential oil. i am 27. and it's bit heavy for me. Strongly scented! Sandalwood sent is overwhelming and gave me a headache! I was looking forward to trying this cream because I love Natural Skincare. I use Kora Organics facial oils which are amazing! This cream has a perfume of sandalwood that is overwhelming! I can still be smelt hours after application. It actually gave me a headache. 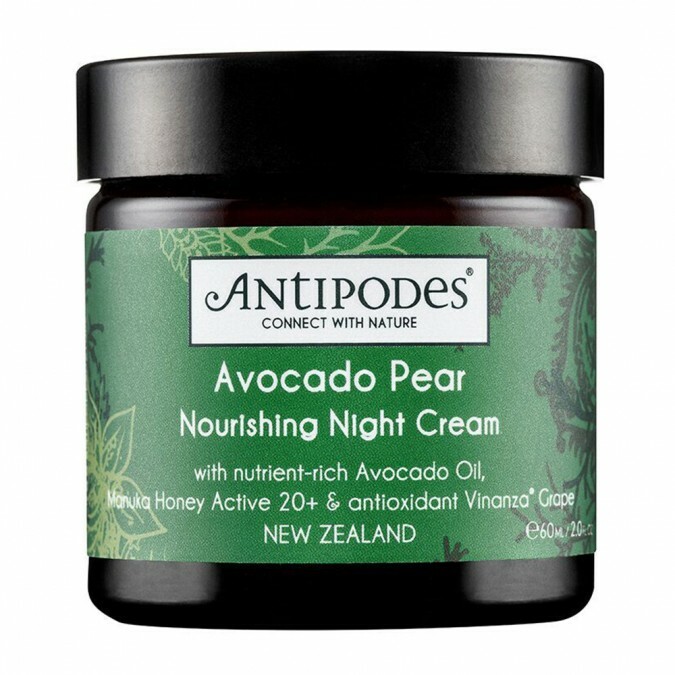 I am confused why manufacturers put fragrance into a natural facial cream. $50 down the drain! Best night cream i ever use !! It makes my skin so soft smooth and nice. I will never change night cream ! !